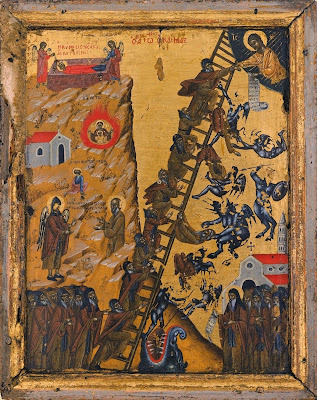 John Klimakos (Climacus) is the author of "The Ladder of Divine Ascent." John came to Mt. 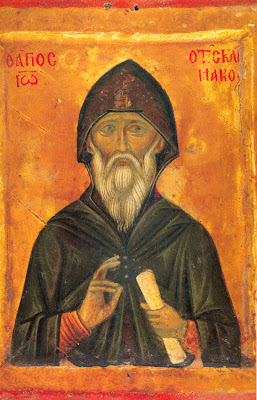 Sinai as a sixteen year old youth and remained there, first as a novice under obedience, and afterwards as a recluse, and finally as abbot of Sinai until his eightieth year. 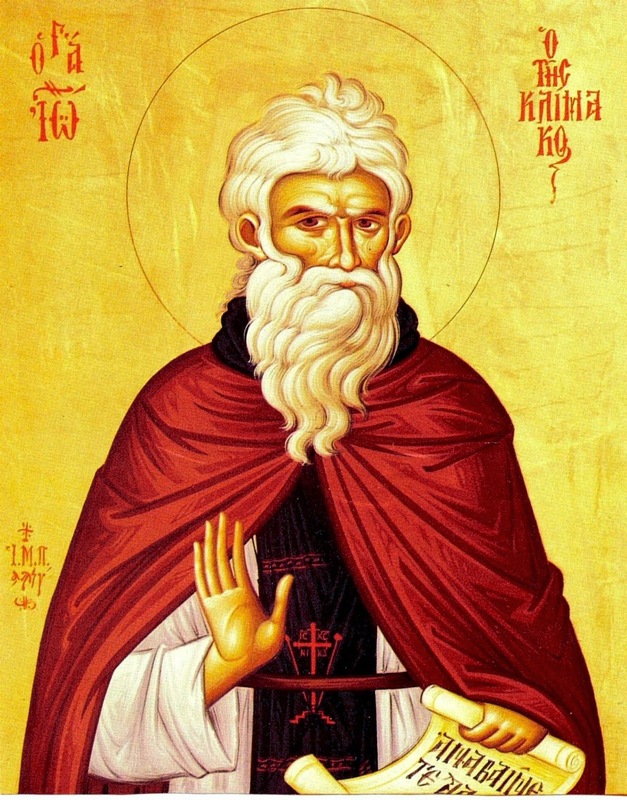 He died around the year 563 A.D.
His biographer, the monk Daniel, says about him: "His body ascended the heights of Sinai, while his soul ascended the heights of heaven." 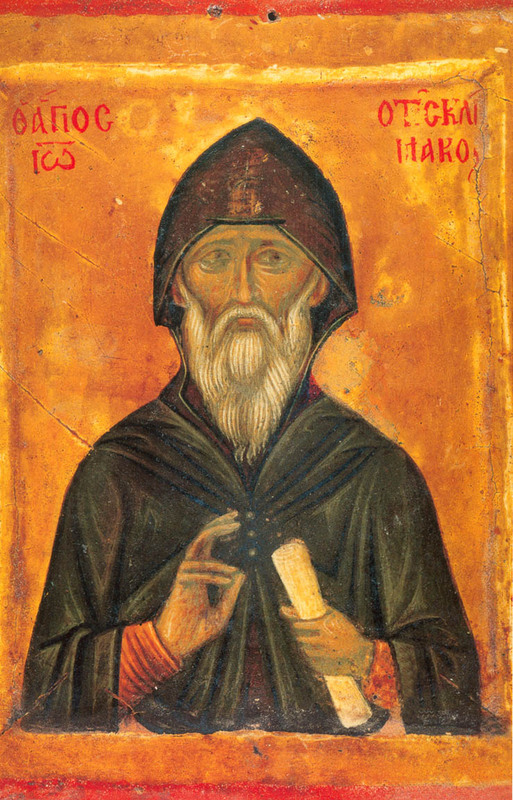 He remained under obedience with his spiritual father, Martyrius, for nineteen years. 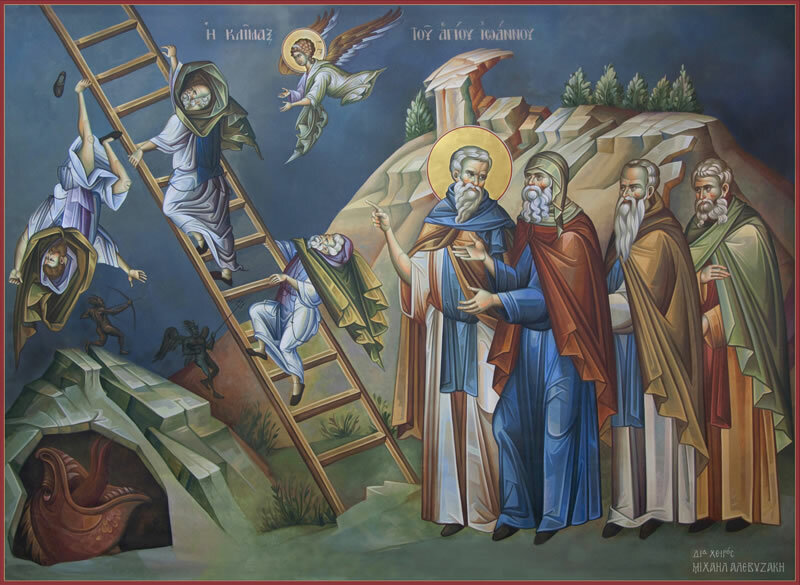 Anastasius of Sinai, seeing the young John, prophesied that he would become the abbot of Sinai. After the death of his spiritual father, John withdrew into a cave [at Thola], where he lived a difficult life of asceticism for [forty] years. His disciple, Moses, fell asleep one day under the shade of a large stone. John, in prayer in his cell, saw that his disciple was in danger and prayed to God for him. Later on, when Moses returned, he fell on his knees and gave thanks to his spiritual father for saving him from certain death. He related how, in a dream, he heard John calling him and he jumped up and, at that moment, the stone tumbled. Had he not jumped, the stone would have crushed him. At the insistence of the brotherhood, John agreed to become abbot and directed the salvation of the souls of men with zeal and love. From someone John heard a reproach that he talked too much. Not being angered by this, John however remained silent for an entire year and did not utter a word until the brothers implored him to speak and to continue to teach them his God-given wisdom. On one occasion, when six-hundred pilgrims came to the Monastery of Sinai, everyone saw an agile youth in Jewish attire serving at a table and giving orders to other servants and assigning them. All at once, this young man disappeared. When everyone noticed this and began to question it, John said to them, "Do not seek him, for that was Moses the Prophet serving in my place." 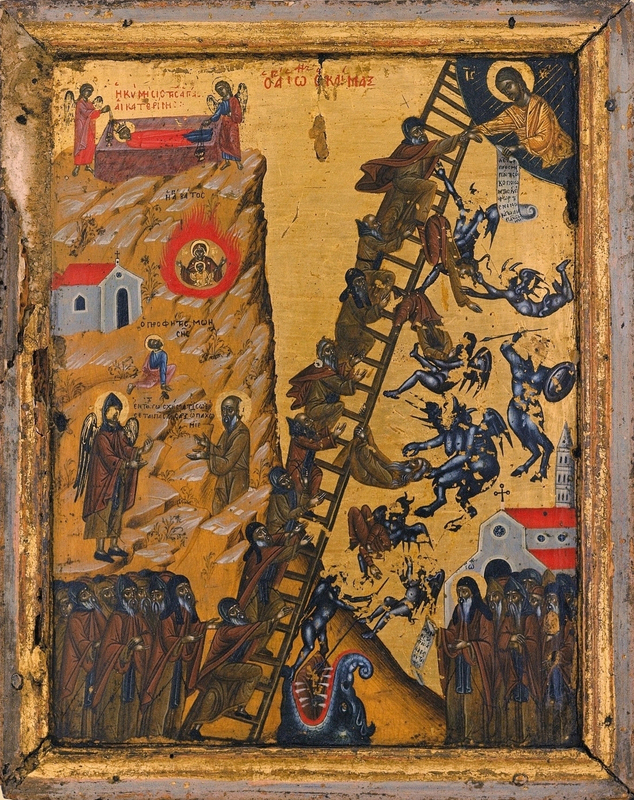 During the time of his silence in the cave, John wrote many worthwhile books, of which the most glorious is "The Ladder". This book is still read by many, even today. In this book, John describes the method of elevating the soul to God, as ascending a ladder. Before his death, John designated George, his brother in the flesh, as abbot. George grieved much because of his separation from John. Then John said to him, that, if he [John] were found worthy to be near God in the other world, he would pray to Him, that, he, [George], would be taken to heaven that same year. And, so it was. After ten months George succeeded and settled among the citizens of heaven as did his great brother, John. "Ascend, brothers, ascend eagerly, and be resolved in your hearts to ascend and hear him who says: Come and let us go up to the mountain of the Lord, and to the house of our God, who makes our feet like hind's feet, and sets us upon high places, that we might be victors with His song." 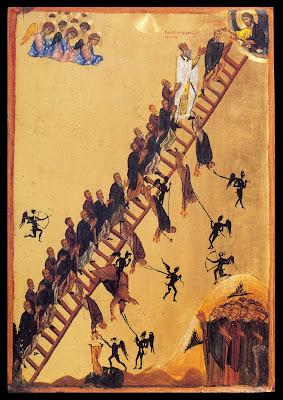 - St. John Climacus, The Ladder of Divine Ascent, 30.36. As ever-blooming fruits, thou dost offer the teachings of thy God-given book, O wise John, thou most blessed, while sweet'ning the hearts of all them that heed it with vigilance; for it is a ladder from the earth unto Heaven that conferreth glory on the souls that ascend it and honour thee faithfully. "Six days before the Passover..."